One of the most widely used cutting tools in construction workshops all around the world is miter saw. Cutting is a major operation in various construction projects – wood work, metal work, concrete work etc, and as a result has a huge influence in the quality of a completed project. Getting the best miter saw can save a saw user from various disadvantages. There are various brands of saws that are being made available in this category of saws. They come in a wide variety of shapes, sizes, colours and as well, make use of various innovative mechanisms. DeWalt is the leading brand of power tools used in woodworking and manufacturing industries. DeWalt observe strict quality control in designing and manufacturing of power tools to assure that the products meet high quality standards. Moreover, the quality of DeWalt’s products is further enhanced by constant product testing of their power tools to check and correct any potential defects.Among the high-quality power tools offered by DeWalt are table saw, drills, and miter saws. Miter saw is one of the most important power tools used in woodworking. It is designed to provide accurate miter and crosscuts on different types of woods. There are several factors that should be considered when buying a miter saw including the size and materials that will be cut, the cutting capacity of the miter saw, and its capabilities. Miter saws are available in different sizes and configurations with different capabilities to cater the needs for various applications. A miter saw with 12-inch blade diameter gives a better cutting capacity than those with 10-inch blade diameter. A 12-inch compound miter saw also have the capability to cut larger hip rafters and crown moldings. 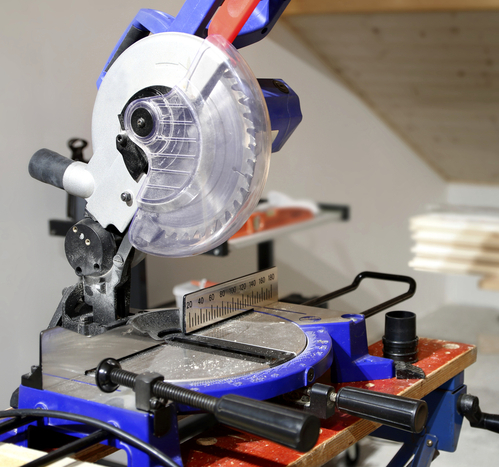 For safety purposes, a good miter saw should feature a self-retracting blade. These features of a good miter saw can be found in DeWalt DW715 Miter Saw. The DeWalt DW715 12-inch miter saw is designed to provide precise cuts for a series of miter-cutting and cross-cutting tasks. The DeWalt DW715 miter saw is ideal for woodcutter, carpenters, and furniture makers who want quicker completion of their woodworking tasks. The DeWalt miter saw’s portability makes it also ideal for hobbyists, do-it-yourself enthusiasts, and ordinary individuals who want to make home improvements and renovations in various areas of their homes. The DeWalt DW715 miter saw delivers excellent accuracy and versatility for various woodworking applications. It boasts a study and functional design with easy to use locks and control. The12-inch blade of the DeWalt DW175 is supported by a 15 amperage (amp) motor that runs for 4,000 revolutions per minute (rpm). Moreover, the miter saw’s detent plate is easy to adjust, allows detent override, and has 11 stops for improved productivity. The 0 to 50-degree miter capacity of DeWalt DW715 also adds to the saw’s versatility. The compound miter saw can provide bevel cuts on 2 to 8-inch dimensional lumber in a clean and accurate manner. The DeWalt miter saw comes with built-in handle for easy and comfortable transport of the product on various areas of the workplace. The design of the miter saw’s innovative base fence gives added support to the fence. DeWalt DW715 has the ability to cut base moldings of up to 6 and 1/2. The DeWalt DW715 miter saw’s exceptional mechanism, performance, versatility, and portability make it a good value for the money for its users. It is one of the most efficient and convenient power tools for woodworking that can be used by both professional woodworkers and ordinary individuals. It is big enough to perform larger cuts, yet small enough to be carried in various areas with ease. The DeWalt DW715 miter saw’s outstanding features make it highly recommendable and a much better choice than its competitors. The DeWalt DW715 12-inch compound miter saw guarantees optimum customer satisfaction each and every time it is used. DeWalt has released another innovative power miter saw that can be used by people working in the manufacturing and woodworking industries. The DeWalt DWS780 Miter Saw is one of the best power tools in its kind. It has the fine precision as well as the rugged durability needed by professionals in the job site. The DeWalt miter saw is designed to cater various woodworking applications including heavy-duty framing, deck building, and delicate woodworking applications. The DeWalt DWS780 miter saw is the best choice of power tool for anyone who is engaged in the woodworking tasks including trim carpenters, installers, furniture makers, and contractors. Moreover, the miter saw’s excellent capacity, accuracy and performance makes the tool ideal for ordinary individuals who are fond of creating wood crafts as well as those who want to perform different woodworking applications. The DeWalt DWS780 miter saw has exceptional solid construction. The miter saw also have an improved light emitting diode (LED) light through its XPS cross cut alignment system for better illumination of the work area. The exceptional calibration system if the DeWalt miter saw does not need any calibration even when the blade is changed. The DeWalt DWS780 is designed to resist constant rigors in the work area through the miter saw’s precise bevel system, fences, rugged guards, and miter detent plate. The powerful motor of the miter saw features 15 amperage (amp) and can deliver up to 3,800 revolutions per minute (rpm). The DeWalt DWS780 boasts different cutting capacities including nested crown capacity of 7 and 1/2 inches, vertical capacity of 6 and 3/4 inches, and horizontal capacity of13 and 7/8 inches. The DeWalt miter saw also comes with a rail lock latch for maximum vertical cutting capacity. The miter saw’s dual bevel system is designed to have easy adjustment of angles as well as high-visibility scale for easy usage even in different conditions in the working environment. The miter saw boasts a 0 to 49-degree bevel capacity as well as 60-degree miter capacity to the right and 50-degree miter capacity to the right. The DeWalt DWS780 miter saw also includes a miter detent plate that can be adjusted and has 11 positive stops. The miter saw comes with a blade wrench, a carbide blade, and a dust collector bag. In terms of quality, value, capacity and performance, the DeWalt DWS780 miter saw is the best in its kind. It matches that features of other expensive miter saws. It is affordable enough for ordinary individuals who want to conduct woodworking projects at the comfort of their own home. Moreover, the DeWalt miter saw is designed to meet the demand of its users in terms of its ability to make accurate and precise cuts. DeWalt is known for its reputation as a company that creates the high-quality tools for wood workers, carpenters, and furniture makers. Its product offerings include generators, drills and saws. The company’s DeWalt DW713 Miter Saw is ideal for performing crown moldings as well as for cutting baseboards. The DeWalt DW713 is known for having the ability to complete different woodworking tasks in an accurate and quick manner. It is also known for its excellent performance, quality, and flexibility. The miter saw boasts a convenient miter and bevel stops, easily adjustable cam-lock miter, and a powerful motor. It can perform different woodworking projects such as cross cutting and miter cutting applications. The DeWalt DW713 miter saw is ideal for professional and amateur woodworkers who want the best miter saw to cater the different applications that they will perform. The miter saw is also ideal for ordinary individuals and beginner do-it-yourself (DIY) enthusiasts who want a quality tool that is easy to operate and can perform various woodworking applications for home repair and improvement projects and woodworking tasks. The DeWalt DW713 miter saw is the best choice of power tools for miter and cross cutting applications. Its 10-inch blade is supported by a powerful 15 amperage (amp) motor. The DeWalt DW713’s speed of 5,000 revolutions per minute (rpm) makes quicker completion of framing, cutting, and molding tasks. It is designed to provide precise cuts and enables its users to perform necessary setups needed for miter applications. The miter dent plate of the saw’s miter system is made from stainless steel and has 11 positive stops for improved efficiency. The DeWalt DW713 miter saw also features a cam-lock miter handle that is easy to adjust and can provide accurate and quick miter angles. The miter saw’s 0 to 50-degree miter capacity to the right and to the life adds to the product’s versatility. The miter saw has increased capacity for its bevel to enable its users to easily adjust bevel cuts from 0 to 3 degrees to the right and 0 to 48-degree bevel cuts to the left. The DeWalt DW713 only weighs 35 pounds, making it portable enough to be carried around the work place with ease. The product comes with a carbide blade, a built-in dust collector bag, and a blade wrench. The DeWalt DW713 miter saw is the most effective and convenient tools to be used in various woodworking applications. It surpasses the performance offered by its other competitors in terms of making accurate and precise cuts in various types of woods even in different angles. The DeWalt miter saw has also better build quality, robust design, and angle markings than other miter saws available in the market. These features make the DeWalt miter saw that best choice for a miter saw. It is a great secondary saw for professional woodworkers and the primary saw for ordinary homeowners, and hobbyists. The Bosch 5312 Miter Saw is a 12 inch miter saw with a Dual-Bevel side that provides a precise performance required by specific projects. 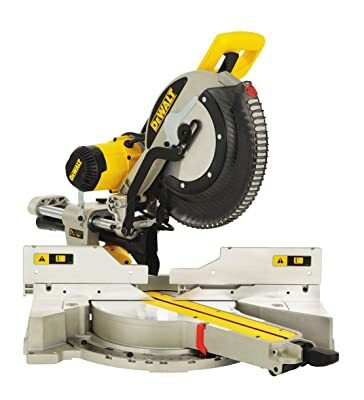 It covers ideal high-class performance for series of jobs including molding and crown framing because this type of miter saw performs a quick, precise ad clean cuts on a more reliable manner. 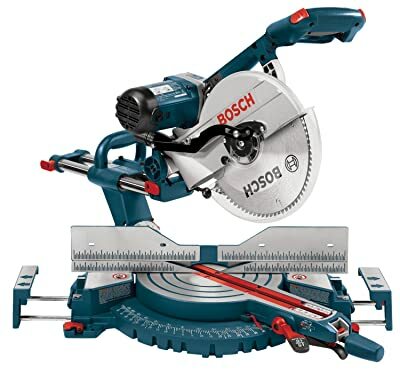 The Bosch 5312 Miter Saw is highly recommended for professionals who are mostly engaged in cutting jobs because this tool provides excellent performance. Home owners specifically the males can also buy this product because it is important for home use. Individuals who are in the field of carpentry can also buy this product for efficient fast and reliable working results. The Bosch 5312 Miter Saw is a kind of specialized saw with distinct features and capabilities. It is a tool that provides performance with great precision and of high quality functions. It is packed up with a durable 60 tooth-blade, dust bag, work clamp and dust bag. It is powered by a 15-amp motor and can accommodate ranges of sizes of materials. It has a base with sliding extensions and a 40 inches total length. It possesses fences (track sliding) for easy set up and efficient molding cutting capacity. Bosch Miter Saw is installed with electric brake that stops the blade on specific time during cuts that are done quickly and repeatedly. It has sharper blades that provide precise cuts over longer hours of work. Bosch 5312 Miter Saw is a type of miter saw that has stable bevel setting for a more dependable results. This setting provides an easy access of bevel lock and selector knob. This tool provides an ultimate accuracy and precision and can work even on set angles. The product has a rail design which is dual sliding that makes it to be superior in quality and accuracy. The product is said to be fast, durable, accurate, and can perform long hours of work and function. The Bosch 5312 Miter Saw is a highly recommended product with the great capacity of performing accurate and precise cuts. This feature makes the product unique in terms of functionality and performance. Truly this product is something that customers should have because of its effectiveness and durability that gives the user positive and satisfying working results. 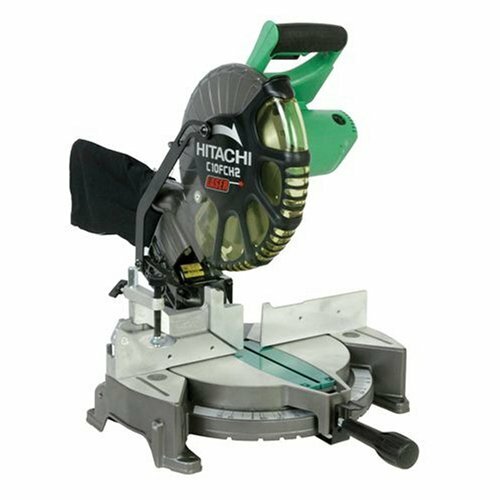 The Hitachi C10FCH2 Miter Saw is a type of saw with laser marker that provides precise and accurate cuts on varieties of materials such as plywood, fiber and hard boards, decorative panels and aluminum sashes. Hitachi miter saw is equipped with miter angles that functions with great cutting flexibility and capability that provide the users with ideal and versatile type of functionality. The Hitachi C10FCH2 adopts a system known as Laser Marker System that perfectly functions in maintaining and observing appropriate and accurate alignment and stable blade location. It has unique features that promotes precision and on miters and bevels. Its adopted Laser Marking Technology is another significant benefit because perfect cuts are made every time this exclusive technology is being implemented on various applications. The Hitachi C10FCH2 miter saw is a helpful tool that functions well on cutting and sawing required to complete specific tasks. The Hitachi miter saw is playing a wide range of functions and benefits to all individuals who demand for precision and excellent working results. Carpenters can buy this Hitachi C10FCH2 miter saw because it is a helpful tool ideal for cutting, sawing, and trimming tasks. Woodcutters and framers can also buy this product because it offers a guaranteed safe and effective working experience. Even homeowners who are into similar cutting works and simple repairs at home can buy this product because the product is created to serve the users and provide them with real satisfaction upon product usage. The Hitachi C10FCH2 miter saw is creatively designed with miter stops that are positively thumb-actuated. This feature allows the miter saw to have simple adjustments between zero and five degrees. This design also is responsible for the miter saw’s change of cutting blade in angle for trimming and crown molding. Hitachi miter saw includes a high quality saw blade that measures 10-1/2 inches that makes delicate and complicated woodworks easy and quick. 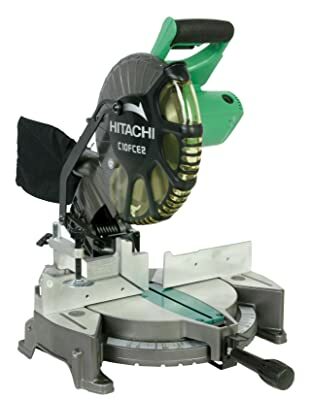 This miter saw is counted to be one of the many specialized tools with excellent functions exclusively made by Hitachi. The Hitachi C10FCH2 miter saw is a beneficial tool with great value and functionality. This tool suits the demand for precision and accuracy and the majority can use this miter saw to be able to prove and see how excellent and effective its performance. A miter saw is one of the most important tools used by do-it-yourself enthusiasts and woodworkers in performing home improvements and repairs as well as woodworking projects. It is used to make accurate miter joints and crosscuts in a piece of wood. A power miter saw is divided into different types including standard saw, sliding compound miter saw, and compound meter saw.These saws differ in sizes, performance, and specifications to match certain requirements of different applications. Having the right miter saw is important in reducing the time needed to complete a task. Consumers should consider several factors when buying a miter saw including blade guard, lock-off switch, blades, and cutting capacity. For safety purposes, consumers should choose a miter saw with self-retracting blades as they provide an unobstructed view of the cutting line and the working area. A good miter saw should also have an electric brake for easier and faster stopping of the miter saw’s motor. The Hitachi C10FCE2 Miter Saw is one of the best power tools in its kind. It provides accurate and smooth crosscuts and miters in different types of woods including plywood, hard board, and decorative panels. The Hitachi C10FCE2 miter saw is ideal for woodworkers and carpenters who want reliability and precision in every cut they make. The Hitachi miter saw is also ideal for do-it-yourself enthusiasts who want to create woodworking projects in easier way. The product’s portability makes it the best choice for ordinary individuals who want to conduct repairs, renovations, and improvements in various areas of their homes. The Hitachi C10FCE2 miter saw’s excellent quality makes it a highly-recommended power tool. Its consistency, versatility, and accuracy enable its users to work with ease. The miter saw is designed to allow easy access to various angles that will be used by its users through its thumb-actuated positive miter stop feature. The product’s extended flip fence is large enough to be raised for up to four inches, allowing its users to cut larger pieces of woods in an accurate manner. Moreover, the dust collector of the Hitachi C10FCE2 is designed to minimize particle and dust accumulation in the interior components of the miter saw and in the workplace as well. The Hitachi C10FCE2 miter saw’s user-friendly features make it the best choice of power tool for beginners. 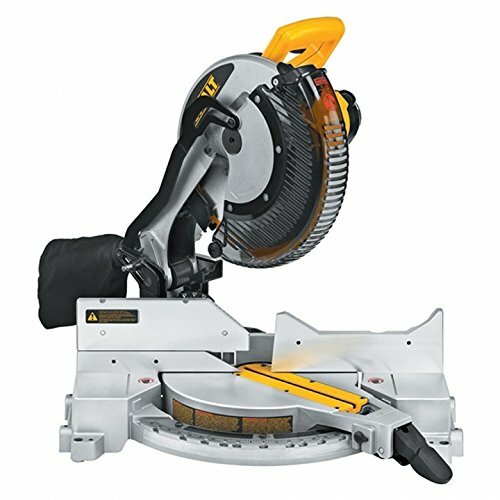 Its exceptional performance makes it highly recommended to professional wood workers and ordinary individuals who want faster accomplishments of their woodworking tasks including trimming and framing of woods. It is the most reliable miter saw that suits the most basic needs of its users. Its light weight makes it ideal to those individuals who make woodworking applications in various areas of their jobsite or homes. When properly maintained and regularly checked, the Hitachi C10FCE2 miter saw will provide excellent and precise cuts every time it is being used by its users throughout the coming years. Since I need to do a lot of cutting every day and I don’t want to carry a heavy tool everywhere with me, it was very simple to lean over to the DeWalt DW715 Miter Saw. This saw has an amazingly powerful motor which allows me to make very precise cuts without getting exhausted. Most of my clients who have miter saws were actually impressed with the accuracy and angled cuts this bad boy can deliver and even complimented me on selecting a DeWalt. I guess that’s something you get to hear when you use a high quality tool that delivers results beyond the expectations of your clients. For me though, this is only one of the reasons to why I use and will always use the DeWalt DW715 Miter Saw.